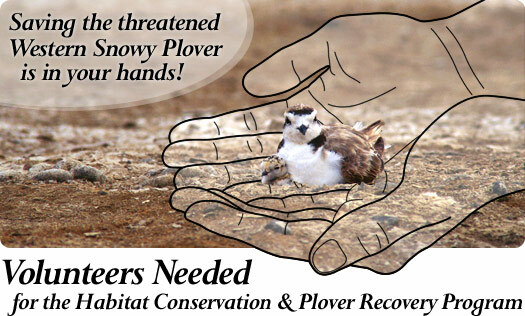 Volunteer to help save the Plover! This website is devoted to protection and recovery of the Western Snowy Plover (Charadrius nivosus nivosus), a small, rare, threatened shorebird that makes its home on certain beaches on the Pacific Coast. For public agencies, organizations, and land owners involved with plover recovery, we promote communication and partnerships to help make your recovery efforts more effective. For the general public, we encourage you to learn about plovers and how to help to save them and their habitat. Links to educational information are on the left side of the page. WesternSnowyPlover.org provides a secure location for recovery site managers, plover monitors, and volunteers from the entire habitat range to safely compile standardized population data, contribute other information, and share resources that will help the recovery effort be consistent throughout the range, recognizing the important differences between individual sites and Recovery Units. The interactive website and database are tools to support multiple recommendations listed in the Recovery Plan. Among these specific actions needed to achieve recovery goals are monitoring of breeding and wintering populations and their habitats, plus their immediate and long-term management and protection, scientific investigations to facilitate recovery, and public information and education programs. To access database features, a user name and password are required. Select "User Log-In" above for "Recovery Tools" that include the Plover Monitor Survey, interactive database, updated maps, resources for volunteer/outreach coordinators, and more useful links. Select "Contact Us" to request access for your site/s. Watch our 11-minute movie for kids about sharing coastal-dune wildlife habitat: "Not Just Mine: Kids and Plovers On The Beach" and enjoy our Kids' Art Signs. Visit "Protecting the Western Snowy Plover" on the Audubon California website; we appreciate their partnership in providing educational information, an outlet for public inquiries, and connections to local volunteer and outreach opportunities. WATCH THE MOVIE on this site! 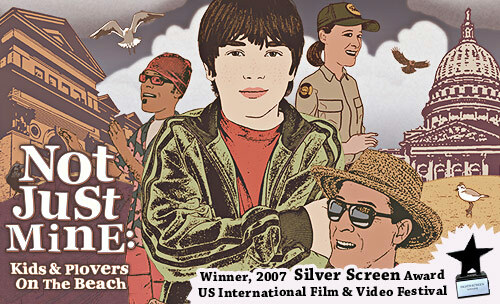 To order a DVD, contact info@westernsnowyplover.org. Want to help the threatened Snowy Plover?